Essentially England News - Do You Remember Where You Were? Did you have a lovely summer? Here, the last week has been feeling unexpectedly grey and chilly, reminding me that all good things come to an end. And that it's time for the next newsletter. And, of course, as soon as I realised that, I also realised what day it was. I'm too young for the where were you when Kennedy was shot? kind of questions, but I can remember 17 years back to a morning when the news was full of a car crash in a Parisian underpass. From thinking it a hoax to finally accepting that it was true took almost a day. The media hype, politics and hysteria were very much not my thing, but now I'm thinking that what people mourned so openly wasn't just a woman who had caught our imagination for almost two decades and who used the attention she drew to raise awareness for those less fortunate. I think that the death of Diana, Princess of Wales, brought mortality home to many of us, reminding us that nobody is immune to death and that we could lose those most important to us in the blink of an eye. 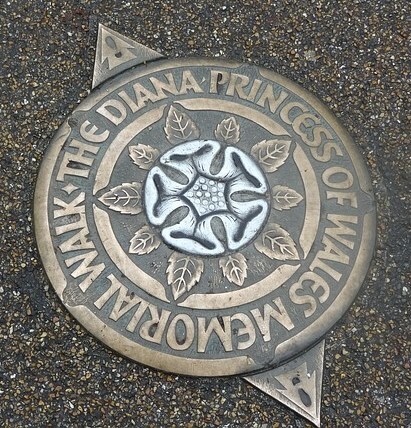 The many reminders of her life that have since sprung up around the country - from good causes to fountains and gardens and woodland walks that all of us can enjoy at any time - are perhaps the best possible memorial for a woman who had a knack for connecting with people and who, while she lived, added a bit of sparkle to the world around us. Did your dad slip a silver coin into your shoe before you walked down the aisle on his arm to be married to the man of your dreams? Do you look forward to finding a lucky sixpence in your serving of Christmas pudding? Or have you served in the RAF and wear a sixpence carefully tucked into the small space behind your wings? Silver sixpence coins have been around since 1551, but even before we lost them to decimalisation in 1971, they've been considered lucky by pudding-eating children, brides and aircrew alike. When the luck-bringing properties of silver sixpence were first recognised is a fact lost in the haze of time, but even in this day and age they're sought after as wedding favours and general luck bringers. If you're planning your wedding, collecting ingredients for this year's Christmas pudding or are looking for a lucky gift for someone special, then take a look this page on the website, where I'm starting to collect gifts and charms made from lucky silver sixpence coins. I'm on the fence when it comes to the muffins vs. crumpets debate, as I really like them both. English muffins make a great base for a poached egg covered in Hollandaise sauce. They're also lovely at teatime, spread with homemade lemon curd. But, compared to crumpets, English muffins are not seasonal. Not for me, at any rate. 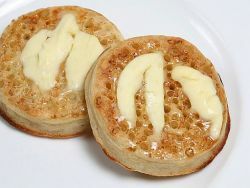 Crumpets, on the other hand…crumpets really come into their own when the weather gets colder. I don't ever buy them when it's warm, but as soon as I reach for a cardigan or think about getting the chimney swept in preparation for an evening of sitting beside the fire, along comes a need to have crumpets. Part of the reason for this is that crumpets are excellent with both savoury and sweet toppings, so you can have them whatever the time of day! Crumpets are fairly straightforward. There's a recipe on the site if you'd like to have a go at making your own, but I must admit that I mostly buy mine. So what's the best way to enjoy your crumpets? Cover with cheddar cheese and pop under the grill until the cheese is nice and bubbling. If Marmite's your thing, spread some on your crumpet before you add the cheese. Toast your crumpets and serve as a quick lunch with softly scrambled eggs on top. Add slivers of smoked salmon for a posh lunch or late breakfast. As you can see, with crumpets almost anything goes. And that's just the way we like it. Enjoy! As the weather gets a little less summery I tend to spend more time in the kitchen, experimenting with new ingredients and enjoying a raft of fresh vegetables. I feel rather like exploring English cheeses right now, so there may be cheese recipes in the next newsletter!